Mish's Global Economic Trend Analysis: Yet Another Dispute Over GDP; What's Really on the Fed's Mind? Yet Another Dispute Over GDP; What's Really on the Fed's Mind? Disputes over GDP go on and on and on. 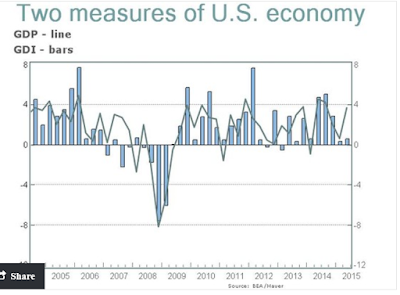 MarketWatch reports By another measure, the U.S. economy was ho-hum in second quarter. There are two ways to compute how well the economy is doing. One is to tally all the goods and services produced during a given time period — that’s called gross domestic product. Another is to measure all the incomes earned in the production of those goods and services — that’s called gross domestic income. Over time, they should be exactly the same. But measurement isn’t easy, and so the Commerce Department not only reports both figures, but also for the first time on Thursday averaged the two together. The result wasn’t great: It’s showed a 2.1% average for the second quarter, since GDP growth was a sterling 3.7% and GDI was a meager 0.6%. According to Josh Shapiro, chief U.S. economist at MFR, that’s the largest gap between the two measures of the economy since the third quarter of 2007. “Some research has shown the GDI figures to be a more accurate representation of economic activity, but the evidence is mixed and the debate continues. Nonetheless, the disparity reported in Q2 does lend credence to the notion that the GDP growth reported in the quarter likely overstates the underlying vitality of the economy in the span,” he said in a note to clients. That may look significant, but let's investigate further. On a year-over-year basis it's hard to discern any gap. The dispute of Josh Shapiro, chief U.S. economist at MFR, is easily seen as total nonsense. I don't believe the economy is as strong as most claim, but I certainly won't post easily disproved charts to make my point. Still, one has to wonder "What's really on the Fed's mind?" I surely doubt it is fear of inflation, at least as they claim to measure it. It's possible they fear bubbles, but I doubt that too. The Fed historically has been blind to bubbles. Rather, I suspect they have come to the conclusion this recovery is as good as it gets, and if they cannot hike now, they will not be able to. That may sound lame, but it is exactly how economic clowns think. Let me phrase it this way: "We need to hike now so we have ammunition to cut when we need to." Meanwhile, nothing the Fed says at all is believable if for no other reason than historical precedent that proves without a doubt, they clearly have no idea what's really going on, especially at turning points. They cannot really come out and say "We are clueless bubble blowers", can they?